Halifax Water’s work will include the replacement of the water and wastewater system in various areas, the addition of a deep stormwater system on Wanda Lane, and channel improvements in Ellenvale Run. 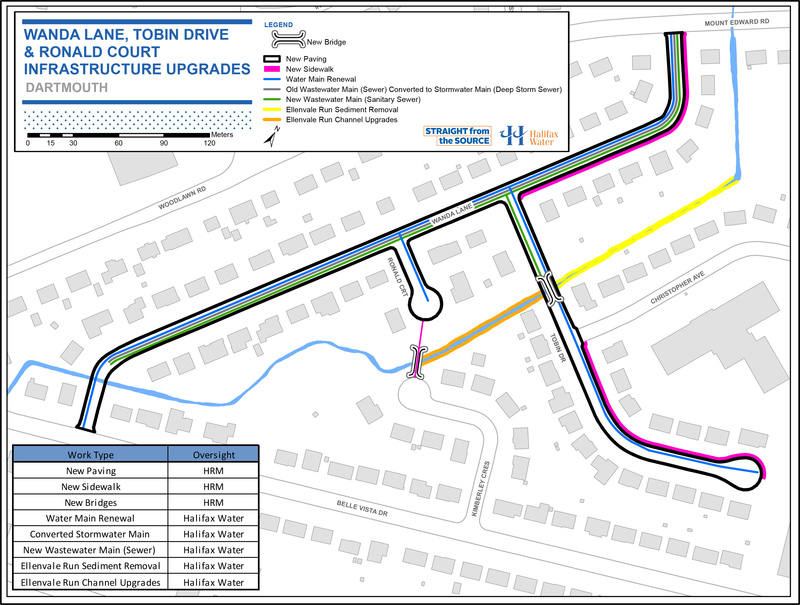 Pending council approval, the municipality will be undertaking various street improvements including curb, gutter and sidewalk work, as well as the replacement of the bridge on Tobin Drive. These upgrades will provide road and underground service upgrades and reduce the amount of stormwater entering the wastewater system from public infrastructure. For more information on inflow and infiltration check out our Homeowner Responsibilities page. If you install a new stormwater lateral to connect your house to the new underground stormwater pipe found at your property line, this will be at your cost. Any stormwater sources connected to the wastewater system must be disconnected at your cost.